I got a simmilar one. The big one i first hooked by chance and lost in the first jump. A couple of days later i was back on the same spot. The same fish took the fly and this time i got to play him a bit longer before he went down in the lake and around a log or such and snapped the leader. Even a couple of days later i was fishing the same spot, there’s usually some nicer rainbow trout there in the early summer. I was casually laying out my #12 Elk hair caddis and in a drift i saw the water raise and my heart skipped a beat, the other times he had taken on a wet fly but this time it was dry. A few drifts later i just saw this massive head and wasn’t sure it had taken but yes! I played it and kept it on the surface as much as i could with a #4 rod and a 0,18mm tippet. The fight lasted about twenty minutes and when he was in the net i just laid back and laughed and cried and laughed. 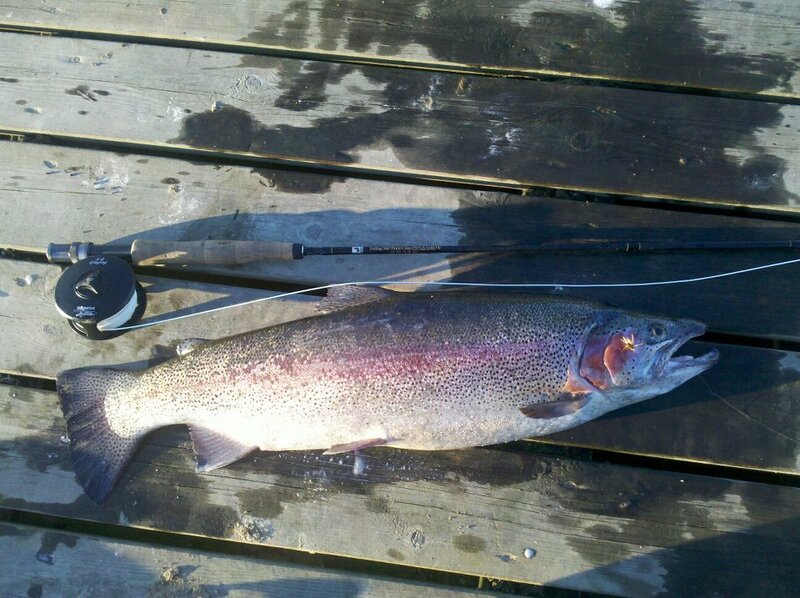 3.5 kilo rainbow trout male with a big hook jaw. 75 cm long and by far the biggest rainbow i’ve ever caught and one that i’d be more comfortable playing on my twohanded rod with a much thicker leader. As these are escaped fish in Sweden and not naturally occuring he was for the chopping block. He lasted 2 dinners for two and one for three people and as always i tanned the skin. The big one that i finally got the better of. You can see the fly on his cheek. Wow! What a fish and what a story! And on light tackle… that makes the story even better. I can only imagine what it felt like to get him in the net! I hope that I have the story of how I went back and nabbed my fish too! Great story. We always remember the big ones that got away….even if by ‘big’ I mean the foot long plus Fall Colored Brookie I hooked and played on a skinny mountain stream, high in the Idaho Lemhi Ranges….I still see his colors, racing and dancing across the 4 foot wide pool….oh, the colors I saw. He too didn’t look very big when he rose to the BWO Emerger…not big at all….just like the rest of the micro brookies I was hooking that day…..I was wrong and the battle was short. I have a story kind of similar to that… I have been trying to catch a Master Angler bluegill (A 10″ bluegill in Nebraska) since I started fly fishing. I snuck up on a bluegill at Holmes Lake in Lincoln that first summer, and caught a peak at a huge gill eating off the surface. I managed to lay a perfect cast in front of him and bring him to the shore. When I measured him, he came out to 9 and 3/4 inches! Ha! I almost wonder if it would have been better to have not seen him… then I wouldn’t have known exactly how nice of a fish got away! Ha, I don’t think I have enough nice words for the Diva… Keep reading; I think the best is still to come! I am torn by that statement, how can you possibly post stuff that’s better than this? But, yes, the good stuff just keeps on coming! Normally fishing isn’t my thing, but this was just too well written to not give you a follow and a like. Thank you so much! I really appricate it! I try not to write a “how to” fishing blog, but one more on what fly fishing means to me! This is the BEST blog post I have read to date. And amazing story. The BEST comment I have gotten on my blog yet! Thanks for both your comments! Stick around… hopefully there are many more great stories coming! Thanks!!! You can bet that I will keep fishing! Great Storey!! Jaques and other Big One’s that got away might help you stay present, always imagining and wondering, even as our bodies age and fall apart this storey will be timeless. I’ve never had a Big One, just lots of little ones..even biting on my backcast and flying through the air with the forward swishs of my rode. I felt really bad. Sorry little guys. When I first started fly fishing, I once had a bass fingerling take a small nymph… except I didn’t notice. Poor thing was casted out into the water. I only noticed because the fly felt heavier all the sudden… I released him, I hope he survived his flight! Thanks for the read, and you can bet that I will be chasing Jaques for as long as my body will let me! A good read. I would compare this to The Old Man and the Sea, except this is probably longer! As for Jaques, are you referring to the character from As You Like It? Thanks for the comparison to Hemingway; I can’t think of a better compliment for an outdoors writer! I enjoyed reading this… I just don’t have any luck fishing… all of them get away. But enjoy the search for Jaques! Stick around… I will be spending plenty of time searching for him! In the meantime, thanks for the read! I don’t listen to Katie Perry, and I was completely unaware that she had a song by this title. “The One Who Got Away” is a long old phrase referencing fishing; but often applied to relationships. I’ll have to go and check out the Katie Perry song to see how that reference effects the post! Thanks for the hint and the comment!!! I have a couple of friends in Germany right now!!! I love to play with photos for this blog. There is something about a path that leads to the wilderness that I really like. Glad to hear that is an image that can be found globally! yeah, i really like that as well,thats the plus if you’re living in a rural area. I would love to see your pictures! If you use the Facebook link on the side of the blog, you will get to my blog’s facebook page which is an easy way to share photos with me! I studied English/Creative Writing in College, so I am very conscious of art and composition when it comes to photos… but I am not actually that huge into photography. All photos taken on the blog myself are taken on my iPhone. That is all I use! I have a favourite fishing saying. “Big or small we catch them all.” Courtesy of my Uncle George. I can’t say I have heard that one before, but I might borrow it! Now I just have to get to the catching them all!!! Thanks for the read and the comment!!! I bet you won’t have to look to hard! Fishing is an American past time; more so then even baseball. In some parts of the country it is even heavily engrained in the local culture. It definitely was so in my family’s culture. I haven’t fished since I lived back on the farm. Reading this makes me want to get the ol’ lure with my dad and try to catch as many catfish as we can. Fishing is a great way to build relationships, and connect to those that you closest with. That’s why I take my daughter, Little E, every chance I get! Hopefully she builds these memories like you did, and someday makes this same statement! So cool….beautiful description and illustrations. Reminds me of a girl I once knew….good luck! “The One Who Got Away” can definitely be applied to relationships too… lots of people will definitely notice that connotation. Thanks for your comment and your read! That’s an amazing way of explanation, you def just passed the “no pictures” test, thank you for those words. This is a great story! Reminds me of the movie the big fish. You’ll eventually catch Jaques. Thank you for reading! I hope you check out the rest of my blog… lots of other good stuff on here; even if you don’t fish yourself!!! Fishing at Wildwood…I remember taking my son there many moons ago…Always so peaceful and relaxing. I don’t live in Nebraska any more and I sure do miss it! Wildwood is one of my favorite lakes. The state renovated it about a decade ago, and it is probably one of the best bass lakes in the area! Hopefully you stick around, you see plenty of southeastern and south-central Nebraska on this blog! I really appreciate the follow and I will have to check your blog out too! Believe me, I will spend plenty more time chasing Jaques! Thanks so much I aprreciate it !! You are a superb storyteller sir. The whole tale reminded me of my grandfathers fishing stories. He too had “that one that got away.” I’m not much for fishing myself. I’m nowhere near patient enough and have been known to do the Ernie (sesame street) and fish call ha! Funny thing, I always end up catching the biggest fish! Drives my husband crazy! My mother has the same habit of catching a fish just a little bit bigger than my dad’s each time they go together. My dad has threatened to stop taking her on numerous occasions! Hahaha! been there donre that.No one but the one doing the fishing would believe it.However as they say its my story and I am sticking to it.The story brought back many memories of fishing trips for me. Thanks for sharing love it.